Many states require a lifejacket onboard while kayaking. A comfortable lifejacket can go a long way for your enjoyment on the water and your peace of mind even in the roughest conditions. 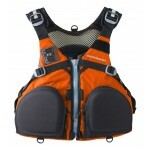 The lifejackets we offer have been hand selected to offer the kayak fisherman enough freedom of movement and cool features to be considered for kayak fishing. See our Sea Kayaking Safety article for a "must know" information.